For many, the word “Salem” brings to mind visions of cartoon witches, jack o’ lanterns, and the smell of fall in the air. 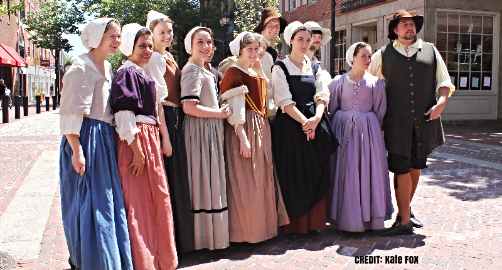 The epicenter of the 1692 witch trials is steeped in history, but visitors will find that much of Downtown Salem, MA is happily thriving in the 21st century. Funky and fun, we have the perfect itinerary for a day of past meets the present for your next Salem adventure. Start the day off right with a slammin’ breakfast at the Ugly Mug Diner, winner of the Northshore Magazine’s Best of Northshore in 2014 and 2015. From egg creams and coffee to breakfast poutine and “Mac Daddy” macaroni and cheese, there is something to tickle all taste buds. A fan favorite is their Lox Benedict, a twist on eggs benedict, replacing the ham with smoked salmon and decorating the delicious egg with pickled red onion and capers. Also known as the Turner-Ingersoll Mansion, the House of Seven Gables is one of Salem’s most notable landmarks, and is the oldest surviving 17th century wooden mansion in New England. One of the main claims to fame of this historic destination is the inspiration it provided for Nathaniel Hawthorne’s gothic romance novel of the same name. End the night with something different, dine at Opus where East meets West for some Asian-American fusion delicacies. Voted as Northshore Magazine’s Best Sushi of Northshore in 2014 and 2015, Opus offers crazy maki roll combinations in their cozy Moroccan style space. Opus Underground is their swanky basement level lounge space, and features different musicians every week as well as $5 sushi and karaoke on Tuesday nights. When is the best time to visit Salem? Most would say October, but we suggest steering clear of Halloween season. “For most people, October is way too much,” said Trickett, “My favorite times of year are early summer and September. The city is generally running on all cylinders, so you're not disappointed by things being closed, but it’s not absolutely hopping mad.” When planning, avoid Mondays as most historical sites are closed. Those staying for a few days would be keen to visit later in the week, noting that many stores and attractions close early Sunday as well.